There is more to Rishikesh than just the holy temples and serene surroundings. Recording major footfalls, this tourist destination in India has developed to provide an amazing lifestyle to the locals of the city and to the travelers in this holy city. With many boutiques, fitness centres, beauty parlours etc, the people of Rishikesh are soon catching up to commercialism at its best. The city of Rishikesh is known as the yogic capital of the world. Though there are many yoga ashrams providing a healthy, tried-and-tested way of living to the locales, the youngsters in Rishikesh do prefer gymnasiums and fitness centres for their fitness needs because of which many gymnasiums have opened up in Rishikesh. Some of the fitness centres are Fitness alert at Indralok Hotel for unisex gym with steam and sauna, Olympia Fitness at Mishra compex, Verizon Fitness at Vaishno Plaza, Viva at Rama Palace for exclusive, yoga, dance and aerobics classes, Balaji gym at Shyampur bypass. The city of Rishikesh is popular worldwide as the yoga capital of the world. The city is filled with yoga ashrams and meditation centres which offer courses on yoga, philosophy and meditation. 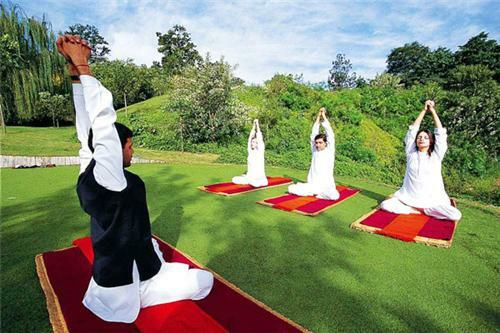 The place is famous for its hatha yoga and pranayama yoga. These centres are now an integral part of the lifestyle and culture of Rishikesh. Yoga is the foremost science and takes care of one’s mental, emotional and physical problems. This medication technique is been organized worldwide by the various centers located in Rishikesh. There are many Yoga Ashrams in Rishikesh and some of the highly reputed ones are mentioned below. There is also the Sri Ved Niketan Ashram which is famous worldwide for its special yoga techniques which have been found to be very healthy for the body and soul. People who visit Rishikesh for pilgrimage or adventure tourism make sure they attend one of the yoga sessions at these ashrams. There is also an international Yoga Festival held every year from 2nd February to the 7th of February by Uttarakhand tourism. Wherever a person lives, outer beauty has always held a certain level of importance in our lives and the women of Rishikesh are not indifferent to it either. As susceptible to the charm of looking beautiful and well-groomed, the number of beauty parlours in Rishikesh are evidence to their love for looking beautiful. Some of the parlours are Monalisa beauty parlour at Maniram road, Meenakshi beauty parlour at railway road, Trivani beauty parlour at Mukherjee road, Venus Herbal beauty parlour at railway road. A wellness and health centre for the locals and the travelers, Rishikesh offers a great range of spas and ayurvedic spas to the people. Some of these spas are Ananda in the Himalayas at the Palace estate in Narendra nagar, Sattva spa at ayurvedic retreat, Baradari palace for wellness spa. There are many boutiques on offer to the locals in Rishikesh. Some of these are Om Boutique, Shrishti boutique, New Mahi Boutique, Amar boutique, Kaya Kalp Boutique.